In the late 1940s, American Youth for Democracy was the youth wing of Communist Party USA. American Youth for Democracy (AYD) replaced the Young Communist League during World War II. The AYD was a step backward from a Marxist-Leninist youth organization, instead of being a broad anti-fascist organization. 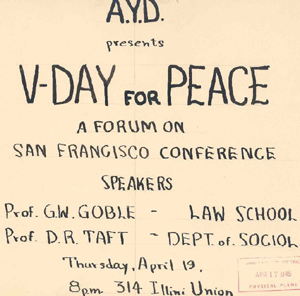 The AYD did campaign for youth rights and battled racism, the cold war and anti-communism, but did not meet the needs of youth in the post-war era. Michigan: Abel Lee Smith, Anabel Barahal, Rolf Cahn, John Gallo, Erma Henderson (State president), Bob Purdy, Phil Schatz, Robert Cummings (State secretary). New Jersey: Douglas Barrett, Evelyn Gordon, Willie Mae Gordon, Mary Adanatzias (director, Essex County). California: Bob Zakow, Chuck Bruck, Ralph Johnson, Vicki Landish, Henry Leland, Elaine Rose, Betty McCandless, (chairman, Los Angeles Youth Council). This page was last modified on 1 January 2013, at 23:12.